A high relief (alto-rilievo) Victorian Gothic style carved panel depicted in the trompe-l'oeil style. 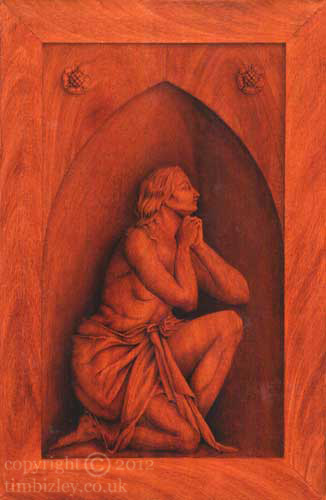 This work was carried out using traditional wood graining techniques overlaid with transparent oil glazes using artists oil pigments. The highlights were reserved from the start and no white pigments used. This is a technique similar to water colour painting in that it is worked light to dark, rather than, with the aid of white pigments, dark to light. Trompe-l'oeil art is undertaken to commission.